The Sac State 5K Fun Run is an event for every physical level and ability! This is a run that you will love as you make your way through the California State University, Sacramento campus. 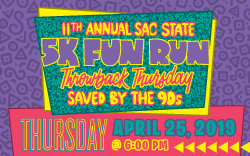 2019 Race Day Festivities include a pre-race Zumba warm up and an award for the Largest Team Participation We hope that you join us for this annual event, and have a great 5K experience at Sac State!